Week two, Day 8 of the 30 Paintings in 30 Days found me painting a Blue Jay. 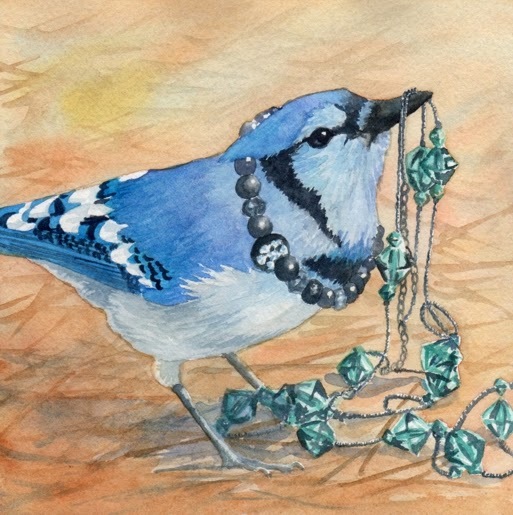 I think Blue Jays are a very pretty bird and already seem to be wearing jewels in their feathers. I guess this Jay wanted to be even fancier and decided to put on some jewels! The Jay was painted with a mix of cobalt and manganese with just a touch of permanent rose in a few places. The feathers at the tail area were painted with Peacock blue, a very bright turquoise blue.